Given its cost, flexibility and effectiveness, BRT has a key role in the development of an integrated public transport system for Dublin. It delivers higher capacity on existing busy bus corridors and provides an attractive alternative to car transport, with fast and reliable journey times. This high quality integrated public transport mode uses buses on roadways or dedicated lanes to transport passengers quickly and efficiently to their destinations, while offering the flexibility and adaptability to meet changing transport demands in the future. For appropriate corridors, Swiftway offers many benefits compared to other transport solutions – including the important advantages of being relatively quick to commission, cost-effective to install and less intrusive during the construction phase compared to light rail or underground alternatives. BRT is increasingly becoming a major component of city transport systems worldwide – over 166 BRT schemes are in operation and several hundreds more are in development across the world. It represents a step-change in bus transport – by providing a high calibre premium service at a much lower cost than rail systems. 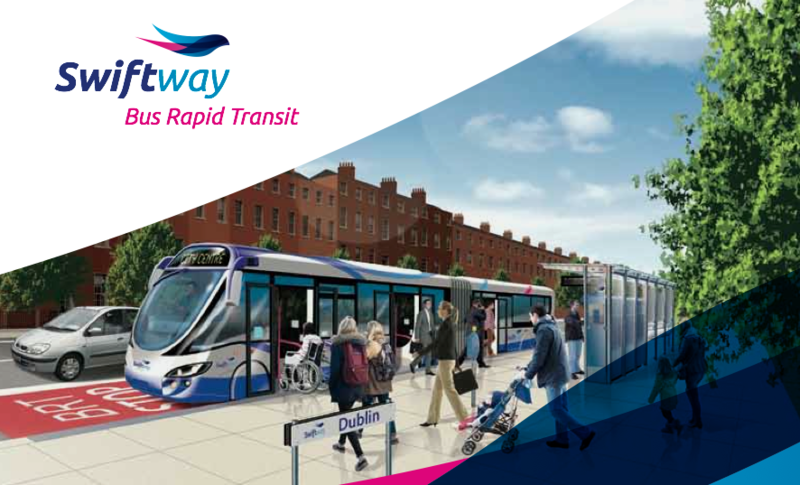 Delivering higher capacity on existing busy bus transport corridors, it provides an attractive alternative to car transport, with fast and reliable journey times, and will form a key part of Dublin’s overall public transport system.